Imagine that. Making money and not even leaving your couch. Don’t believe me? Watch this space – I’m going to show you nine different ways to make $1000 in a month whilst never leaving your couch. If you’re one of the many people out there who are feeling like this, this one’s for you. There’s never any money at the end of the month. You’re not eating take-aways or having cappuccinos you can’t just ‘cut them out’ to save extra money. There’s truly nothing to cut. This post is for you, baybeee! But, as in most things to do with money, it comes down to one question: how much you want it? Are you prepared to give up your TV evenings? Or wake up an hour early? Or push through the inital stages of low take up to build followers and reviewers? It’s said that dollar millionaires have over 7 different sources of wealth. Yip, they don’t just have one salary. They have 7 different ways they make money. Some of them make them money whilst they sleep. And that’s where most of us go wrong. We only have 1: our job. So I’m going to show you how make money sitting on your couch in the first two of those buckets: trading your time and selling a product. Design. The world belongs to the creatives! There are so many places you can do design work, the world’s your oyster. Try 99Designs, FIVERR, Upwork to start. Sell other people’s products (affiliate marketing). 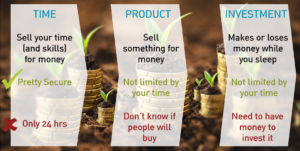 I love this form of selling – you don’t need a product, you don’t need the fulfillment or shipping engines, you just do the sales and marketing and have a unique link that when someone clicks on it they go to the seller’s website and if they buy, you earn! The quickest example of it is by becoming an Amazon affiliate. Sell on Etsy. If photo taking isn’t your thing, but making things with your hands is, Etsy is one of the world’s largest craft sites. Their marketing page says they have low fees (they take just 3.5%), they have powerful tools to help you promote and grow your business, and they have a lot of educational support. There’s something for everybody. You just need to prioritise time. But just 1 hour per day could make you $1000 or over R13,000 per month extra. Just remember that for many of these side-gigs, you need to build ratings and reviews so you rank higher. Persist, ask others to rate you, it just takes time.